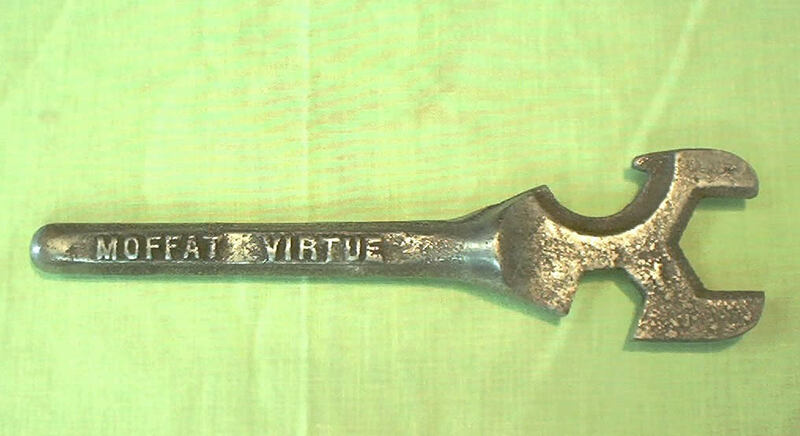 These tools were made as accessories to domestic and light industrial products. Typically the spanners were supplied with the product at the time of sale and were generally provided to enable the end-user to perform routine operating or maintenance tasks on the product. These products covered a wide range of items such as lawn mowers, beds, gas bottles and spray painting equipment. The quality of the tools supplied often reflected the likely frequency of use and robustness required and so ranged from simple pressed-steel tools to diecast and more rugged forged tools. Arnold. Arnold made spray painting equipment. Note the pricker at the back - mounted on the rivet to the right of the name (ref RT). This wrench is a mystery. Can anyone confirm it as Australian made? Any details? Image courtesy of Gerry Scells. 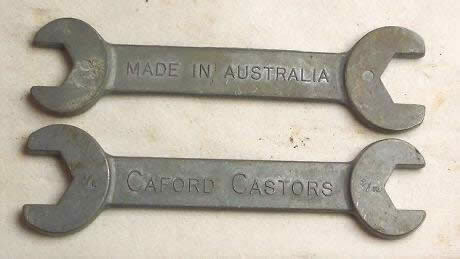 Carford Castors, made in Australia, 100mm long, made of diecast metal. Connolly - Southern Cross - (thought to be supplied by Southern Cross Windmills (Sydney). 3/16W and 1/4W, about 3.5 inches long. Hills, made by Clipsal for Hills TV antennae mounting kits. Perry of Geelong -same both sides. Sher made electric drills, saws and attachments. In 1967 the American Skil Corporation took over Sher Tools Australia creating the Skil-Sher brand. Sliden Products of Sydney. Sliden made sliding door furniture (rollers & hangers). Pope Products Ltd made lawn mowers and other garden products. Note the strong resemblance between this common Pope spanner and the Samson.